Note the scar on the neck where a tissue sample was taken. 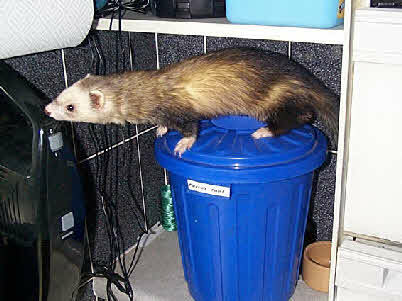 I had a telephone from a friend at work explaining that his daughter, a veterinary nurse, possessed a female ferret discovered wandering along a road; although enquiries were made and notices displayed, she remained unclaimed. Knowing that I had ferrets, Jerry enquired if I had space for one more, telling me she was, “very friendly and needed the company of other ferrets”. I collected her from Jerry, who told me how she had tried to climb up a chimney and had also investigated his son’s ear. At home, I introduced her to two Jill ferrets, Lucy and Susie, and the chaos in the kitchen demonstrated that Grace possessed amazing climbing and jumping skills .Grace shared a cage’s with Susie, then later Lucy, then Zach and finally Jenny. 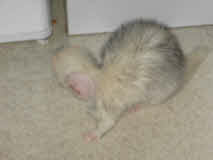 Grace was a very gentle ferret and it was very funny to watch her dragging Lucy, upside-down across the kitchen floor. In 2010 Grace developed a swollen lymph gland , that was diagnosed as cancer. This was kept in check with steroids, but eventually in 2011 she became so ill that she died in her sleep.